Lyman Gilmore strives to have a positive school culture to ensure student safety, responsibility, respectfulness, and a readiness to learn. We believe a positive school culture is central to the job of learning and teaching. We at Gilmore know that when expected behavior is modeled and reinforced that appropriate behavior will be demonstrated by all who enter our campus. By focusing on these expectations students are given the tools for personal success. Working together our dedicated teachers, supportive parents, devoted community members and enthusiastic students find success that positively impacts school wide and individual behavior. The PBIS framework helps support a campus community where staff acknowledge positive behaviors, consistently follow through with fair consequences and provide a system of support for individual intervention. Together we can create and maintain a positive school culture and community. Positive Behavior Interventions and Supports (PBIS) is an organized, data-driven system of interventions, strategies and supports that positively impact school-wide and individualized behavior planning. PBIS focuses on the development and implementation of proactive procedure and practices to prevent problem behavior by providing a systematic framework of school-wide systems and individualized supports. Traditional models of school-wide discipline has largely focused on reacting to specific student misbehavior by implementing punishment-based strategies including reprimands, loss of privileges, office referrals, suspensions and expulsions. Research has shown that the implementation of punishment, especially when it is used inconsistently and in the absence of other positive strategies, is ineffective. Introducing, modeling, and reinforcing positive social behavior is an important step of a student’s educational experience. Teaching behavioral expectations and rewarding students following them is a much more positive approach than waiting for misbehavior to occur before responding. The purpose of a school-wide PBIS is to establish a climate and framework in which appropriate behavior is the norm. 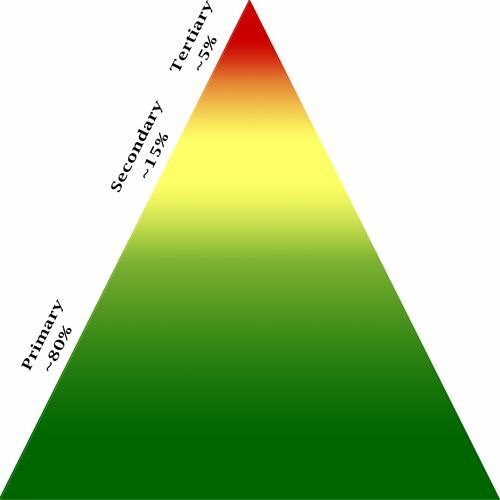 Focusing on a proactive model, PBIS utilizes a three tier behavioral model including Universal, Secondary and Tertiary or Intensive. Universal or Primary Prevention focuses on school and classroom wide systems for all students, staff and settings with an emphasis on prevention and reinforcement of positive social and academic behaviors. Secondary focuses on individual students and/or specific groups of students demonstrating at-risk behavior. Finally the Tertiary Prevention or intensive tier provides support for students that need specific, specialized and individualized systems addressing consistent high-risk behavior. 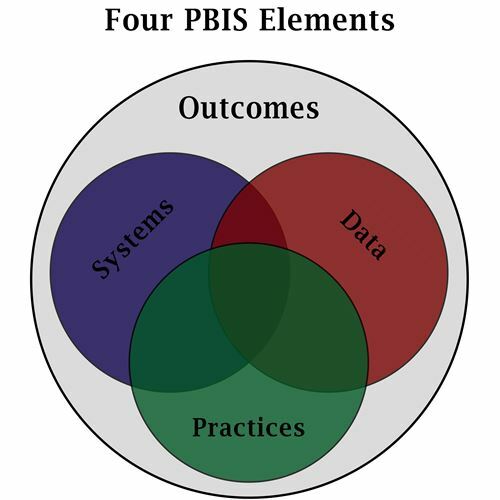 The school-wide PBIS process emphasizes the creation of systems that support the adoption and durable implementation of evidence-based practices and procedures, that fit within on-going school reform efforts. An interactive approach, the PBIS framework includes opportunities to correct and improve four key elements pivotal to supporting positive behavior and academic success. Outcomes: Academic and behavior targets that are endorsed and emphasized by students, families and educators. Data: Information that is used to identify status, need for change, and effects of interventions. Practices: Interventions and strategies that are evidence based. Systems: Supports that are needed to enable the accurate and durable implementation of the practices of PBIS. Consistent and clearly communicated school-wide expectations develop a common language amongst staff and the community providing all students with access to successful, positive behavior. The PBIS framework encourages schools to focus on a few positively stated expectations that are overarching to all current expected behaviors. Rather than large lists of restrictions, Safe, Respectful, Responsible and Ready to Learn embody all the characteristics of positive conduct that Lyman Gilmore currently represents. All-encompassing, these four school-wide rules can be modified to fit the needs of an individual classroom, designated setting, activity or the campus as a whole. Lyman Gilmore's four school wide rules detailed below embody the values of Safe, Respectful, Responsible and Ready to Learn on our campus as a whole and are described in detail on the "Gilmore Code of Conduct" poster that is displayed in every classroom and academic setting throughout campus. Practicing being safe to other students, staff and self and by being where we should be at all times and keeping our hands and feet to ourselves. We handle all personal and private property in a safe appropriate manner. Always showing respect by using appropriate language on and off campus and treating others the way we want to be treated. We respond to directions from all staff members and show respect to ourselves, others and school property. Modeling responsible behaviors by achieving our goals in a timely manner and taking ownership for our actions. We use electronic devices only as directed and only for educational purposes. Coming to class each day ready to learn! We show this by arriving on time, prepared for class and actively engaged in all lessons presented!